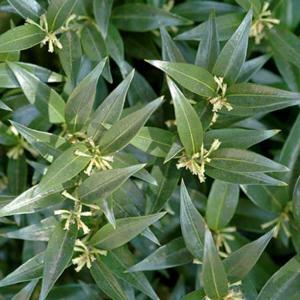 Compact, small evergreen shrub with much smaller, narrowly pointed leaves than the species. 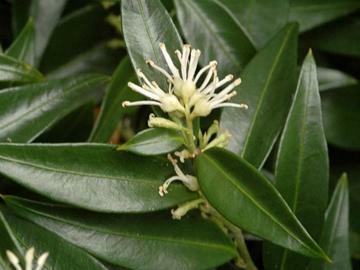 Small, fragrant white flowers in late winter or early spring. Long lasting berries follow in autumn, deep red at first, ripening to red-black. Very slow growing. Humus rich, moist, well drained soil in part shade. Will tolerate full shade and dry conditions once established. Not as cold hardy as some other species. May be lightly trimmed if required, but rarely necessary. From cuttings or division of rooted suckers. Collected by Roy Lancaster in 1980 in Yunnan, China, where it was found growing close to an ornamental temple gate.